One of the biggest challenges for expats in Dubai is staying in touch with family and friends back home. I think it is especially important for children staying away from their extended families to be connected with them. We only go back to India once a year, so that's the only time Little Dude gets to meet his grandparents, aunts, uncles, and cousins. Technology has, of course, made it easier for us to keep connected despite the distances. But for grandparents who may not be tech savvy, it's not easy to check Facebook or get on video chat on their own. There is a special bond they have with their grandchildren, and they miss seeing them dearly. I was sent the Grandparents Frame to try out, and I'm impressed by how easily it can be used to keep family members far and near updated about what our son is up to! 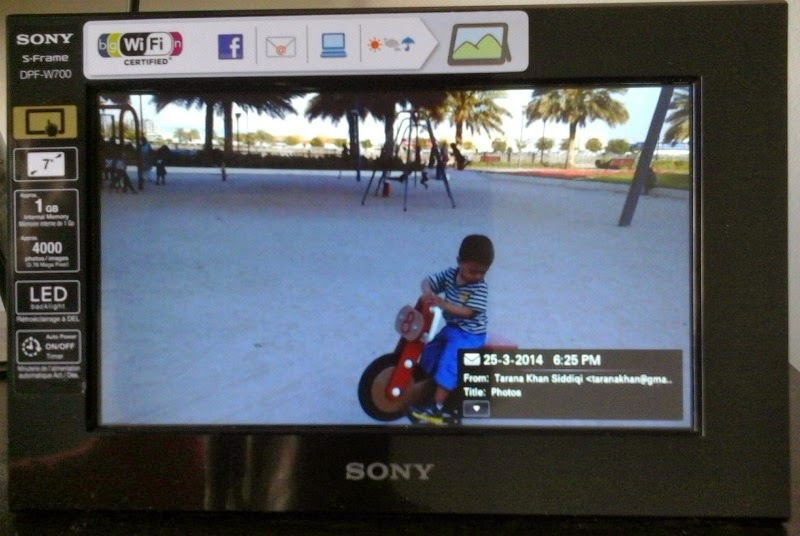 The digital photo frame itself is a Sony S-Frame, 7 inches wide, with Wi-Fi connectivity. I've never used a digital frame before so I didn't know there's so much you can do with it! It allows you to create an email address specifically to receive and display photos. You can also run a slideshow directly through your Facebook account. The frame works in sync with the Grandparents Frame app which I downloaded on my tablet. It's easy to create a profile on the app, and then log in using the email address created on the frame. Once the two were connected through Wi-Fi, I was able to create a virtual 'frame' on the app, and send it directly to the digital frame. The good thing about this virtual frame is that you can choose multiple photos to send, and it is done in one go, through a single click. In about 10-15 minutes, I received an email on the digital photo frame, and I was able to view a slideshow of the photos I has just sent from my tablet. It was as easy as that! 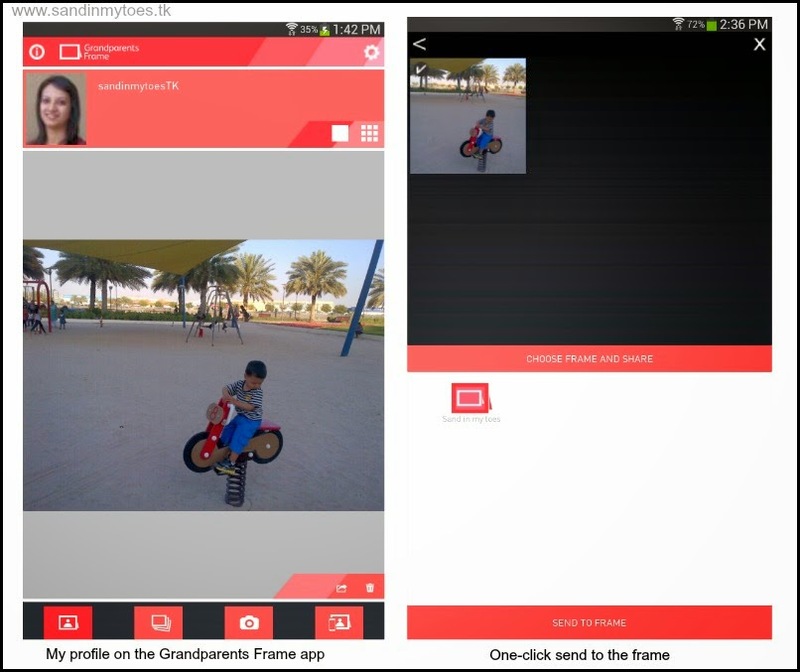 Though this frame was part of the Grandparents Frame campaign, anyone can use this app (currently available for Android devices at the Google Play store). All you need to make it work is an Internet-enabled digital photo frame. I would love to give Little Dude's grandparents this frame the next time we visit home, so we can easily send them his photos, with little effort from them! I was provided the product for the purpose of review, but all views and opinions are my own. So glad that you stopped by my blog - you're blog is great! And, it's great to meet another blogger who is an expat in a country! The frame is amazing, and I agree, it's so important for our kids to stay connected with our families. Thanks for stopping by, Kerry! It's good to connect with you. What a cool idea! I would love to get these for my kids' grandparents - and my own grandmother! That's a brilliant idea :) I love all this technology! What a fantastic idea. I might just get this for my Mum for her birthday - then I could send her pictures of her grandchildren every day. It's definitely good for grandparents, and technologies like this have made things so much easier! Technology can be so amazing, right? An Internet enabled frame would make a great gift for your mom! What a brilliant idea - as an international family (Hubs family in France, my family in Australia, New Zealand and Cyprus) this is just what we need! That's a good idea, all our grandparents are in this country but some are too far away to see too often. You would really benefit from something like this! So glad you liked it, Mike! Technology has really brought us closer in a way. Thanks, Kate! It's so important to keep in touch with them, but sometimes, it's just not easy. What a fantastic idea for families who live far away from each other. My mother has always been local but I have other close family that live farther away and we miss seeing each other's kids grow. This is a great idea and makes a special gift too. We finally got the grandparents on Skype and Whatsapp to connect with us! It certainly is a nice and fast way to keep in touch with family! That's great! We aren't very good with Skype because the little guy won't sit still.